Aftab Khan was born in Trinidad, and received his secondary Education at the Queen’s Royal College. He then went to the University of Birmingham where he obtained a BSc in 1956 in Geology with Physics and then a PhD in 1958 on the Remanent Magnetisation of the Tertiary Igneous rocks of Skye with the physics Nobel Laureate and Royal Society President PMS Blackett as one of his supervisors. His findings supported the controversial hypothesis that the earth’s magnetic field had reversed in the past. He continued to work as a Post doctoral Fellow on the magnetic properties of rocks in Birmingham until 1963 when he was appointed to start Geophysics in the new department of Geology at the University of Leicester from where volcanologists were working in East Africa. His interests then changed to geophysical investigations of the deep structure and origin of the East African Rift on which he worked for the next 30 years. It acquired a new significance with the emergence of the plate tectonic hypothesis in the early 1960s and the observation from satellites of rift-like features on other planets. He became the international co-ordinator of KRISP (Kenya Rift International Seismic Project), a large group of earth and planetary scientists who carried out long-range seismic investigations with controlled sources as well as earthquake and gravity studies. 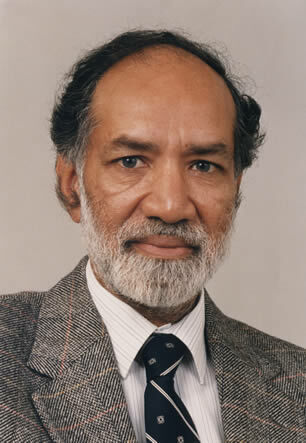 Aftab Khan also conducted extensive research on the deep structure of the unique island of Cyprus, which is a wedge of the deep ocean floor thrust up above sea level by the forces closing the Mediterranean Sea. The island is well known for its mineral deposits (Cyprus means copper) and he has been using it for experimenting with and teaching new geophysical exploration methods. Aftab Khan introduced the first of many university BSc degree course in geophysics in the UK. He has been an external examiner for taught courses and Research degrees world wide. He has served as Head of Department twice, and served on the major university boards and committees. He was passionate about the promotion and education of his subject and has served as Chairman of the British Geophysical Association, and was a Vice-President of the Royal Astronomical Society, which promotes astronomy and geophysics. He has served the International community with distinction as the Managing Editor of the Geophysical Journal International; Chairman of the Governing Board of the School of Cosmic Physics of the Dublin Institute for Advanced Studies; Co-leader of UNESCO Project 400 on the Geodynamics of Continental Rifts; and Scientific Co-ordinator of the remarkable British-USSR Seismic Verification Project which showed that it was possible to use the methods of seismology to detect and identify underground nuclear explosions and distinguish them from Earthquakes and thus verify a Comprehensive Test Ban Treaty. In retirement he continued to promote his subject by writing in and by the installation of educational seismographs in schools and museums in Leicester, Cyprus and Trinidad. He received the Royal Astronomical Society’s Award for Service in 2006 and a medal for excellence in Science from Trinidad’s National Institute for Higher Education and Research in Science and Technology (NIHERST) in 2013. Presidential Address: The science of Verification (Presidential Address, 1988). Transactions of the Leicester Literary and Philosophical Society vol. 82, pp. 1 – 24.